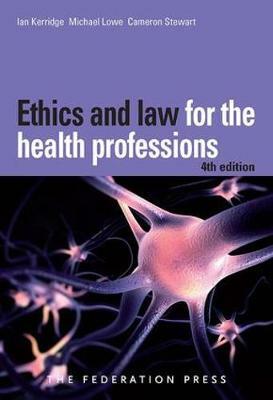 Ethics and Law for the Health Professions is a cross-disciplinary medico-legal book whose previous editions have been widely used by students, teachers and practitioners in the health professions and in law. This new 4th edition has been extensively revised and updated to take account of developments in law, biomedical science, healthcare delivery and bioethics. Sections dealing with critical reasoning, problem solving, professionalism, negligence, standards of care, public health and the emerging biosciences have been considerably expanded and entirely new chapters have been added dealing with sexuality, culture, rural health, evidence and global health. As with previous editions, the 4th edition of Ethics and Law for the Health Professions focuses on issues that are relevant both to clinicians and to health-policy-makers. It combines insights from philosophy, bioethics and the health social sciences, biomedical research data and case law. Importantly, this book recognises that health professionals must understand both the ethical and legal implications of their practice but is careful to distinguish between the two. This book provides an invaluable resource for those who are responsible for the design and delivery of health care and for those who have an interest in how health care can best meet the needs and reflect the values of the community.